France wing Gael Fickou was the toast of Paris on Saturday night after scoring the try which earned his nation a 26-24 win over England. 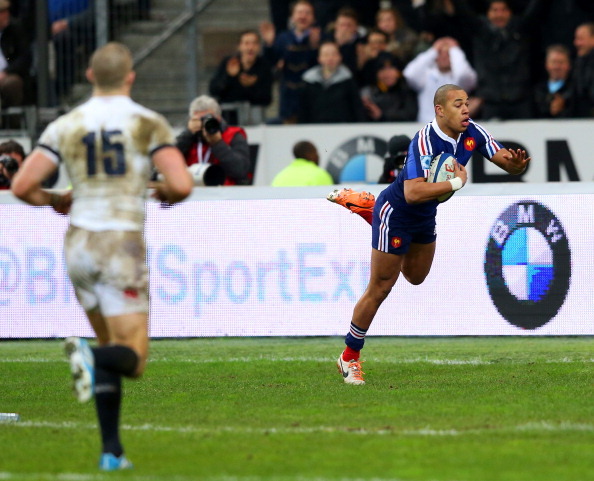 It had looked like France were heading for defeat after England fought back valiantly from 16-3 down to lead 24-19. However, with four minutes to go, France put together a sustained attack and Fickou took a well-timed pass from Dimitri Szarzewski, dummied cleverly round Alex Goode and ran in under the posts to make the match-winning conversion easy for Maxime Machenaud. It’s the sign of a great player when he can put a potentially catastrophic mistake behind him and carry on doing his job to the best of his ability, and that’s exactly what Leigh Halfpenny did during Wales’s 23-15 win over Italy on Saturday. Wales had led for the whole match but Italy were hanging onto their coat-tails and suddenly came right back into the game when, in the 69th minute, Michele Campagnaro intercepted a pass by Halfpenny and raced in for a try which, with Tommaso Allan’s conversion, made the score 20-15 with ten minutes to go. The game was there for Wales to lose, but despite the fact an earlier, uncharacteristic penalty miss must have added to some jangling nerves for the Wales full-back, when Halfpenny was called upon to slot another three points from the tee in the 73rd minute he found the target and helped Wales keep Italy at bay. Italy centre Michele Campagnaro made a bright start to his RBS Six Nations career, scoring two tries against Wales and picking up the Man of the Match award in the 23-15 defeat in Cardiff. He ended up on the losing side, but the 20-year-old centre’s excellent effort, in only his third Test, should give Italy heart and reminds the other five nations not to take them lightly during the tournament. The RBS Six Nations is stealing most of the headlines at the moment but club rugby is still entertaining audiences and players are giving their all for their own local causes. Among this weekend’s club heroes was Northampton lock Samu Manoa, whose two tries gave the Saints a 20-16 win over Saracens and earned them a home semi-final in the LV= Cup. Saracens had taken the lead in the last quarter but Manoa had the final say, grabbing the crucial try. Gareth Steenson played a starring role for Exeter Chiefs as they walloped Worcester Warriors 42-3 to progress to the LV= Cup semi- finals from pool two. They needed a win to qualify and Steenson contributed 22 points, including one try, to make sure the Chiefs achieved their aim. England coach Stuart Lancaster is in the doghouse with many England fans this week after their team fought back from 16-3 down to lead by five points, only to let France in for a late, match-winning try. Among England’s leading lights in the clash at the Stade de France was scrum-half Danny Care, who was at his sniping best, setting up Mike Brown’s try with a swift break, causing the French all kinds of problems and even kicking a drop goal. Lancaster substituted Care for Lee Dickson with 19 minutes to go, when England were leading 21-16, and from there they lost their shape and went on to lose 26-24. Unfortunately for the England boss, it didn’t work out that way. Poor Angelo Esposito. The 20-year-old Italy wing was playing his first Test and must have been hoping to make a steady start, at the very least. However, with just three minutes on the clock, Wales fly-half Rhys Priestland slotted a kick up the right wing, it took a wicked bounce and Esposito was left grasping at thin air as the ball wobbled past him and Alex Cuthbert pounced to touch down for the first try. In the cauldron of the Millennium Stadium, Esposito must have wanted the ground to swallow him up. Italy fought back to give Wales a run for their money, but Esposito knows his mistake presented his team-mates with an uphill battle they could have done without. Sale Sharks needed a bonus point win from their trip to play the Ospreys at the Brewery Field, in order to qualify for the LV= Cup semi-finals. They did all the hard work, scoring five tries in wet conditions, and were leading 36-30 as the match entered its dying moments. However, despite the fact they essentially had nothing but pride to play for in this last LV= Cup pool match, the Ospreys snatched a last minute try from wing Aisea Natoga and Sam Davies converted superbly from the touchline to steal the victory 37-36. Sale only had themselves to blame, with director of rugby Steve Diamond accusing them of switching off during the second half, thinking the job was done. Ross Harrison was sin-binned with 11 minutes to go, for foolishly stopping Ospreys scrum-half Tom Habberfield from taking a quick penalty in his own half. Marc Jones followed his team-mate to the bin a couple of minutes later for killing the ball close to his own line, so Sale were left with 13 men playing 15 and paid the price.